The 31st Annual NJ Elks Peer Leadership Conference was held in Long Branch on Feb 1-3 and hosted approximately 475 students from around the state. The Westfield Municipal Alliance sponsors student attendance annually. 2019 is the 11th consecutive year that student members of the Westfield High School Dream Team, with additional financial support from parents, attended the conference. The 31st Annual NJ Elks Peer Leadership Conference was held in Long Branch on Feb 1-3 and hosted approximately 475 students from around the state. The Westfield Municipal Alliance sponsors student attendance annually. 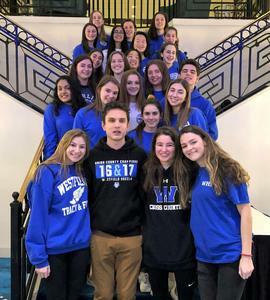 2019 is the 11th consecutive year that student members of the Westfield High School (WHS) Dream Team, with additional financial support from parents, attended the NJ Elks Peer Leadership Conference. The WHS Dream Team is a school club that encourages positive decision-making and healthy choices; their message to students is, “Confidence, Choices, Challenges, Changes”. Representing grades (9-12), twenty-three Dream Team students applied to attend the three day conference this year. Students were chaperoned by Lauren Hauser and Sue Kolesar, educators at WHS and Dream Team co-advisors, as well as Louise DeDea and Kerri Oligino from the Westfield Municipal Alliance. The WHS Dream Team co-advisor and physical education teacher, Lauren Hauser, explained that the annual peer leadership conference is a tremendous opportunity for students to learn and hear others’ stories and bring their messages back to Westfield. “We are thrilled with the interest from our students this year,” Hauser said. General sessions at the conference included DEA agent Nicholas Kolen with an update on the Opioid Epidemic. Speakers from Breaking The Cycle emphasized the importance of honest communication to resolve conflicts and explained to students that angry feelings, words, or texts are the root cause of much of the violence that makes the headlines. Suicide prevention advocates Ann Marie & Pat D’Aliso spoke about their journey, since the loss of their 16 year old son, Pat Jr, to suicide in 2004. Keynote speakers such as Scott Backovich and Sarah Wells presented their personal stories with heartfelt and challenging messages. Scott encouraged students to “Be A Catalyst” with a smaller group breakout session focused on “every student has the power to influence their world”. Sarah spoke to “The Power of Believing In Yourself” with a smaller group breakout session focused on “perseverance and overcoming life’s hurdles”. The students also heard from Hawthorne High School assistant principal Craig Jandoli, who spoke of his own difficult upbringing and the importance of a positive attitude. Craig’s message to students is to “Throw Away the Fear and Step Up” and his smaller group workshop focused on “attitude is a choice”, and “to not be afraid of all the judgement around us”, and challenged students to “look beyond themselves” and “recognize the needs of others”. The leadership conference inspires participants to return to their communities and take the next steps to transform lives around them. Speaking to the value of the conference, WHS Dream Team co-advisor and health educator, Sue Kolesar explained that students crave and need the inspiration, connection to others, and self-reflection that attending the leadership conference affords them. “I wish every student could be impacted by this life-changing experience because drug use, anxiety, and bullying among students could be reduced,” said Kolesar. The Westfield Municipal Alliance supports prevention education and substance abuse awareness programs. Details will be forthcoming on future Alliance and Dream Team programs including The Girl Thing / Guy Thing and the 8th grade / 5th grade outreach events this Spring. A local parent and community liaison for the Alliance, Kerri Oligino, explained that programs which promote positive behavior, strengthen leadership skills, and encourage peer-mentoring are the key components to substance abuse prevention. “Young leaders with positive values, social and emotional intelligence, and confidence in their identity have developmental assets that are incompatible with substance abuse,” said Oligino.